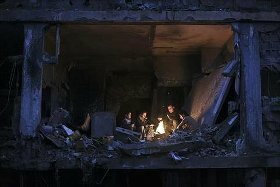 Received 24 December 2012 Meanwhile in Gaza.... a family gathers around a bonfire for warmth in the ruins of their home, bombed to rubble in the latest Israeli offensive against the Palestinian people. Many, many families are homeless in Palestine because their homes have been stolen, bombed or bulldozed. Please think of them and pray for them this Christmas. I sent this as a Christmas card to some friends who share with me the sorrow and outrage in seeing a people so treated 64 years on from the killing and the cleansing of their forebears from their homes, their land and thus from their living. I have just found the time to post it here. I am late but the image and the facts are applicable in every second of every day.